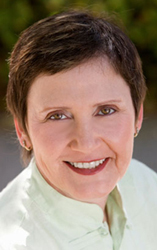 Ingrid finally listened to her calling and changed careers from marketing and public relations to body communication. Now she is happy to let her fingers do the talking, and so are her clients. She admires the human body and the extraordinary work it does for us on a daily basis, and she senses where we are failing our bodies. Her bodywork as a certified massage therapist (CMT) is comprised of Swedish, deep tissue and sports massage; cranio sacral therapy; shiatsu and acupressure; reflexology and lymphatic drainage massage; prenatal and perinatal massage as well as hot stone massage. Ingrid is also fascinated with horses and trained in equine massage therapy. Ingrid's unique massage technique draws from all these modalities to customize it for your individual needs. Massage Rescue employs the help of a very friendly dog to greet all visitors. 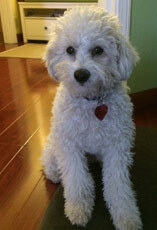 Sophie-Lou is a young, white, hypoallergenic, ten-pound Malti-Poo. She took over from Luit, who is sorely missed. Please let us know if you have allergies or don’t want to share the same office with a dog; we will try and accommodate your needs.